This year’s cover artist was born and grew up outside Boston – interestingly, she notes, at the one-mile mark of the Boston Marathon. 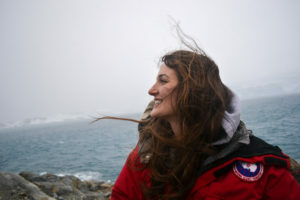 In 2011, Goodrich spent five months in Antarctica (under a National Science Foundation grant) – helping collect plankton for a study of “how diatoms adapted to changing seasons, in order to predict how they might react to climate change.” Simultaneously, she worked on a project that brought science and life on a remote field station to middle school classrooms in the US and honed her storytelling skills. 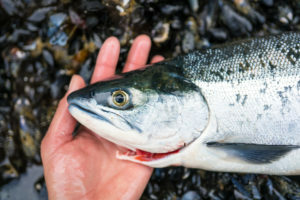 While Goodrich was drawn to Alaska because of “a romanticized idea of the natural splendor of wilderness,” she now spends time thinking “how not to lock people and places away from one another.” The best stewards of the natural world “are those who live, work, hunt and play in local lands and waters.” These values align with those of SCS, where Goodrich works as the Communications Director for the Sustainable Southeast Partnership (SSP). Not just taking photographs, but “living a life worth photographing” was a phrase Goodrich used – actually, a kind of meme among today’s photographers – but it reflects her belief in interconnectedness.